Neck injuries can be life threatening and life changing injuries, disabling you from having a fully functional life. If you have experienced a neck injury and someone or something is at fault for it, you may be eligible for legal action for compensation. At the law offices of Joseph C. Crudo, PLC, we have lawyers in San Diego who are experienced at all types of personal injury claims, including neck injuries. Do not suffer because you were injured at someone else’s fault, contact our law office today to see if you are a candidate for legal action. Sports Injuries – Contact sports are known to be dangerous. Neck injuries are most commonly found playing football, soccer or other contact sports in high school and college students. Extreme Sports – This includes sports like bungee jumping, paragliding, white river rafting, and skydiving. Car Accidents – Car accidents can injure the entire body, but more specifically the neck with whiplash. They are the most common cause of neck injuries. Accidents in Workplace – There are two different types of accidents that can occur in the workplace. The first is a onetime accident, like falling and injuring yourself. The second is an ongoing and prolonged damage that occurs over time, like ergonomic problems from bad posture. Slipping and Falling – Neck injuries commonly occur from simply slipping at falling on a wet surface. Why Should I Hire a Neck Injury Lawyer? Compensation for Your Suffering – When an accident happens that leaves you in severe pain, or even paralyzed, you deserve to be compensated for your suffering. Whether you need assistance with your medical care for the present and future, or your injury has left you unable to work, compensation can be achieved with our personal injury attorneys. Fight Insurance – Insurance companies are known for taking advantage of their customers, which is why we will put up the fight for you. We will hold your insurance companies accountable for the medical bills they should be paying. 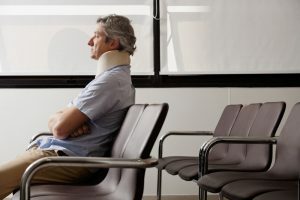 Permanent Disability – If your neck injury has left you permanently disabled and you can no longer work at your current job, this leaves you in a pickle. You will either need to find a job you can do, or face a jobless life because of your disability. We can help secure your future with the help of our team of lawyers. They will ensure you get the compensation you deserve. Our team is prepared to help you through your entire case to secure a brighter future for you. Give us a call at 858-622-7280 for your free consultation or fill out our online contact form on our contact us page.